One of the biggest obstacles that a high-risk business will encounter is getting approved for a merchant account. You’ll need a merchant account if you want to take debit and credit cards, which in today’s day and age is almost a requirement for business. That’s especially true for an online business. But for businesses in high-risk industries like travel, gambling, debt collection, and dating sites, it can be a difficult process to get approval for the account in the first place. If you are a business owner in a high-risk industry, there are a number of things that you can do to make your business more appealing to credit card processors. Demonstrate that your business is financially stable. If your business has been around for a while but you are just now ready to start accepting credit cards, then you’ll have some financial history at your disposal. Be prepared to share your businesses finances with the potential processor. This can show them that your business is real, has earning potential, and is fulfilling customer orders with the goods and services that you’ve promised them. Most processors are just trying to ensure they aren’t processing for a company that’s fraudulent, and a strong financial history will prove that to them. If there is already processing history, show it. Some businesses already have processing history and are simply looking to open another account or open one with a better rate. The best way to improve your chances of approval is to show your current credit card processing history. This will include the number of transactions that you process, how much they were for, and how many of those transactions resulted in chargebacks and how many were fraudulent charges. If you can demonstrate through your processing history that you’ve taken steps to prevent chargebacks and fraud, then you have a much higher chance of being approved for the merchant account. Explain how you mitigate risk. Sometimes, it just takes a letter or a conversation over the phone to explain yourself. Some processors decline merchant accounts because they don’t understand the business or see it as high-risk when, in fact, it isn’t. These kinds of misunderstandings can be addressed through some additional information and explanation. If you are in a high-risk industry, explain what you are doing to avoid chargebacks and what procedures you have in place to prevent fraudulent charges. When the credit card processor understands more about your business, they are much more likely to grant you an approval. Get your credit in line. Both your personal credit and the credit of your business matters here. If you have bad credit, that can affect a processors decision to approve you for a merchant account. You may need to do some cleaning up such as paying off bad debts, disputing incorrect information on your credit history, and paying down debt. All of this can make you and your business much more appealing to a potential processor. If you do have bad credit, be honest about it. Trying to hide it is going to make you and your business look unfavorable. Let the potential processor know that you are aware of your bad credit and what you are doing to try to correct it. If that’s not good enough, you may just need to wait a while until you can work on bringing your credit score up. Work with an experienced high-risk processor. This is the best way to ensure you get approved for your merchant account. 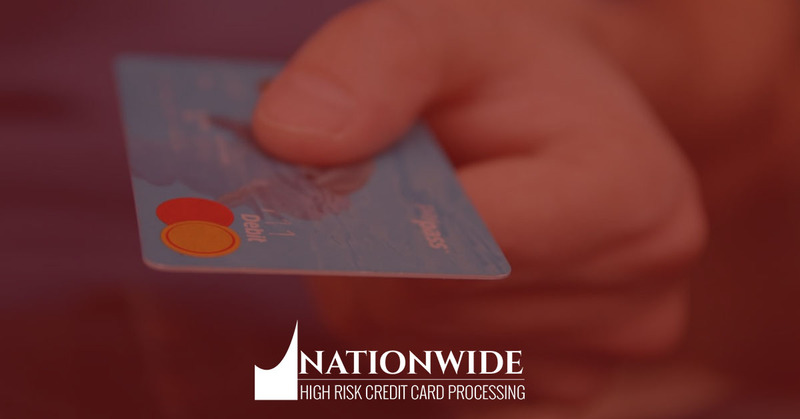 There are a number of high-risk credit card processing companies in the areas including Nationwide. These companies work with businesses in high-risk industries on a daily basis and understand the inherent risks involved in doing so. They’ll be able to help you mitigate your own risk while still boosting your overall sales through credit card transactions. Make sure that you shop around for the best high-risk processing company, though. There are different rates and benefits for each one. Are you currently looking for a high-risk credit card processing company to handle your business’s credit card transactions? Talk to the Nationwide team. We work with businesses like yours in high-risk industries, providing them with the support and service they need to stay competitive in today’s market. Take our 30-second evaluation online and get started with the application process!